Place pinenuts in a small dry sauté pan and cook over medium heat, just until toasted, about 3 minutes. Set aside. Bring a large pot of water to a boil and cook ravioli until al dente, about 3 minutes depending on the brand of pasta. Drain and place on a medium sized platter. Sprinkle with salt and pepper. Place butter in a small sauce pan set over medium heat and add whole sage leaves. Cook for about 6 minutes, swirling, until butter is browned and sage leaves are crispy. 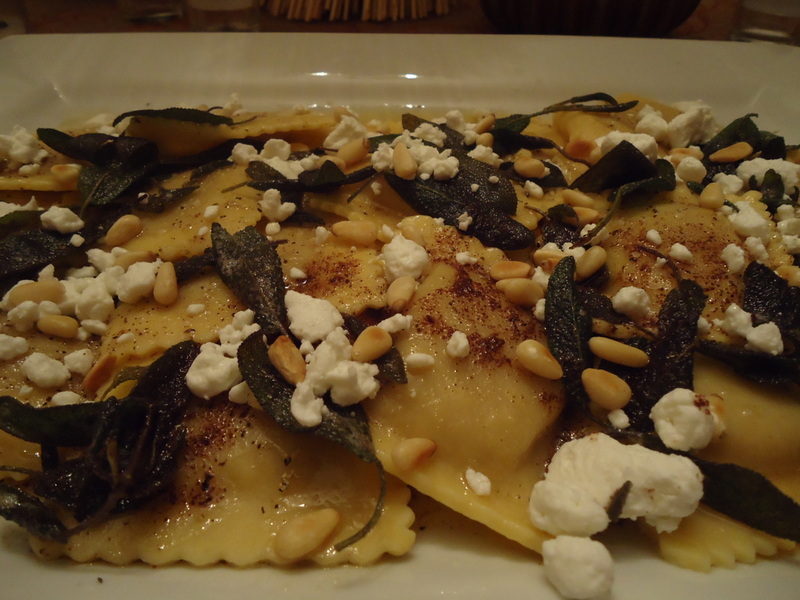 Pour butter mixture atop pasta and finish with crumbled goat cheese and toasted pine nuts.